Love, Mrs. Mommy: Blogger Opp - Groovi Gee Set of 10 Fashion Bibs Giveaway! Blogger Opp - Groovi Gee Set of 10 Fashion Bibs Giveaway! 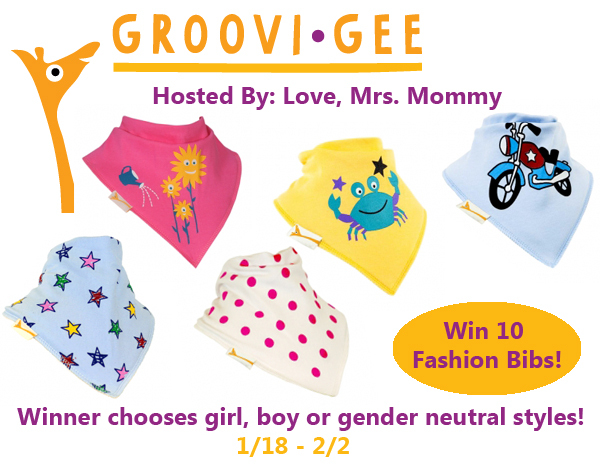 Love, Mrs. Mommy is Hosting a Giveaway for 1 lucky person to win a set of 10 fashion bibs from Groovi Gee! Winner gets to choose if they want girl, boy, or gender neutral styles. I need your help promoting! There are FREE and Paid Options Available. I look forward to working with you to promote this adorable giveaway! Thank you for your help!